There are few things more painful in the movie-going world than to have to sit through a "comedy" that isn't funny. 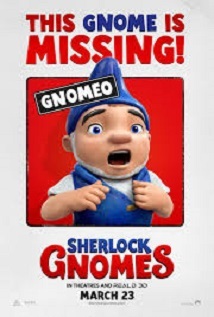 I saw this in a theater with about 20 kids and their parents. There wasn't a single time that anybody laughed out loud. Not once. "How can this be," you ask? "But, I saw the trailer and it was really funny," you say. Well, all of the funny stuff you saw in the trailer didn't make the final cut of the movie. None of it. Oh, and the big hype about all of the reworked Elton John songs? It was all hype. His songs are barely in the movie at all. About the only good thing this movie has to offer are some good nods to the BBC version of SHERLOCK HOLMES. But that doesn't make it worth seeing in the slightest. Just skip this one. There are plenty of great movies for kids coming out soon.